Oh, bless your 458-racing hearts. 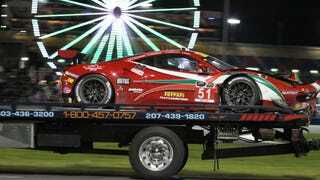 Is it just me, or is it all too often a Ferrari's fault when things go wrong? They're the Camry of the motorsports world like that. I spotted a Ferrari 458 getting flat-towed while I was waiting for the fireworks to start with damage that looks like it hurt. Here's how that happened.